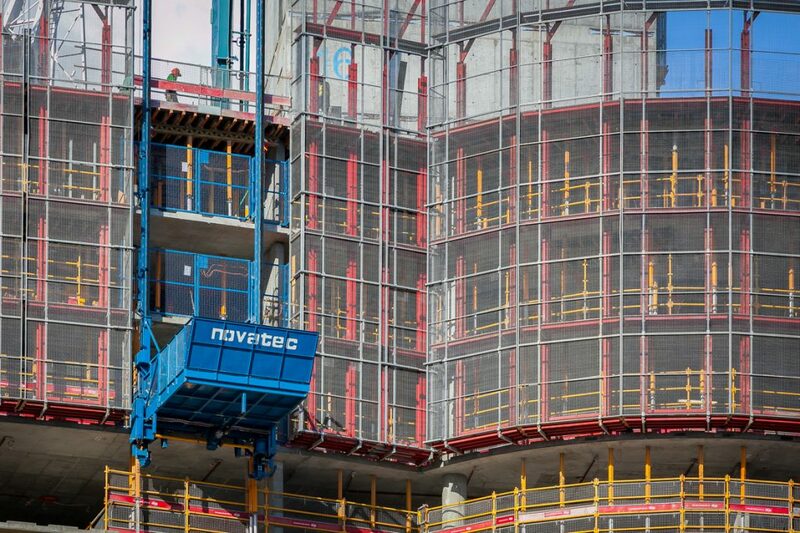 Novatec’s Formwork Hoist is used throughout Australia as a versatile solution for the efficient movement of formwork and materials in high-rise construction. The Hoist is a dedicated self-climbing transport system that operates on demand. It eliminates costly down time waiting on crane availability – operational in high winds, even when the crane cannot. Material is simply loaded and unloaded by pallet jacks onto the large platform. The platform is large enough to carry formwork tables and can be extended to suit your requirements. Live deck and day zero access to the poured deck is possible, reducing formwork cycle times. Material can be unloaded from the Hoist to the live deck while still being formed, or to the newly poured deck as soon as concrete curing allows. The Hoist can be installed either on the outer face of the building or internally. Straight or inclined facades can also be entertained. The highly flexible system allows both hoist car travel distance and landing gate height to be adjusted according to floor height requirements. Novatec can transport the Hoist pre-assembled ready to install or in sections in cases of limited access. The Formwork Hoist meets all Australian and ISO design codes and carries the CE mark. Novatec provides Hoist specific operator training to your licensed Rigger and Materials Hoist Operators, supervision on install and decommission, and ongoing technical support.